Barnstaple Conservative Club always welcomes new members. Current annual membership subscription rates are £16, or £8 if you are aged 65 or over. 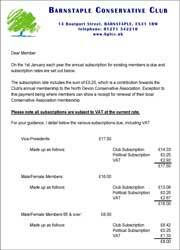 The annual membership subscription includes a 25 pence contribution towards the Club’s annual membership to the North Devon Conservative Association. Exception to this payment being where members can show a receipt for renewal of their local Conservative Association membership.